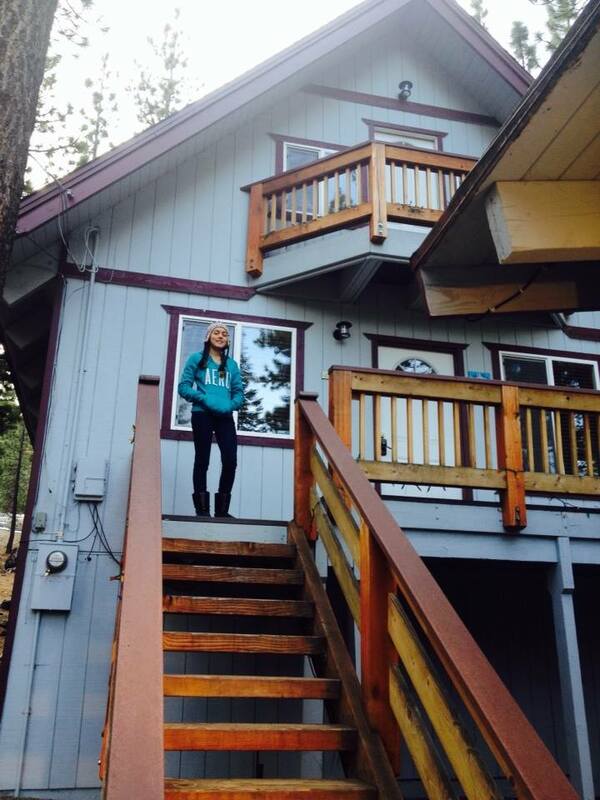 South Lake Tahoe for the whole fam!!! South Lake Tahoe is the most populous city in El Dorado County, California which is located in the Sierra Nevadas. 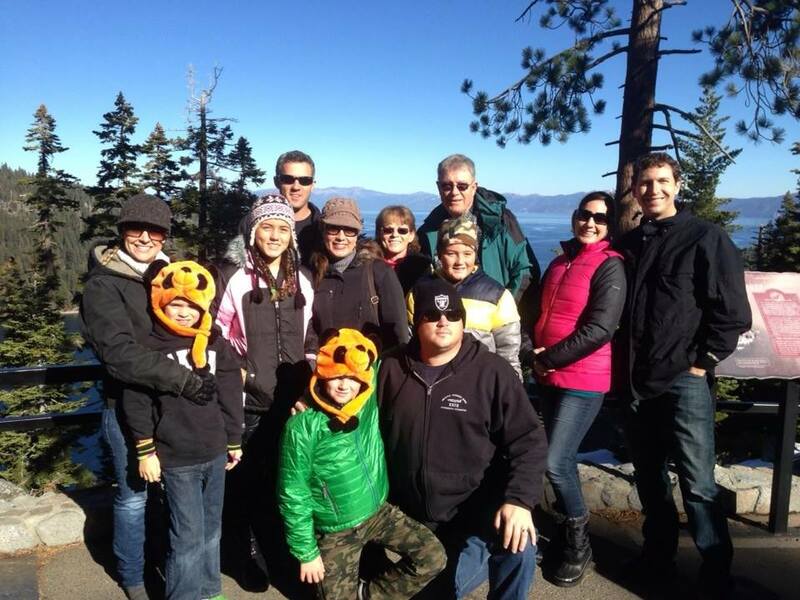 The population in South Lake Tahoe was 21,403 in 2010. The California-Nevada state line which is on the east end of the city, is geared towards tourism, with shops, restaurants, hotels, and Heavenly Mountain Resort. The Nevada casinos are located just across the state line in Stateline, Nevada. 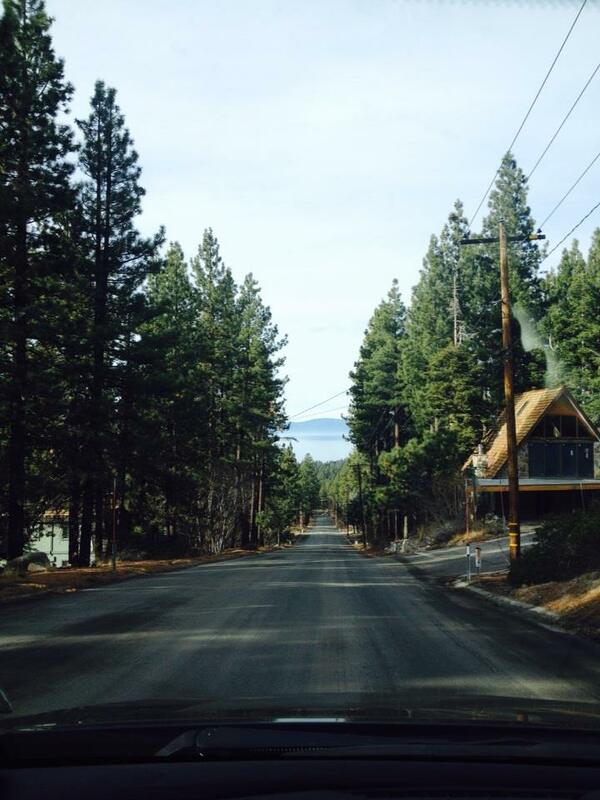 Lake Tahoe Boulevard runs about 5 miles west-southwest along U.S. Route 50. The western end of town is mainly residential. As its name suggests, South Lake Tahoe is located on the southern shore, right next to the Nevada border and the town of Stateline, Nevada. 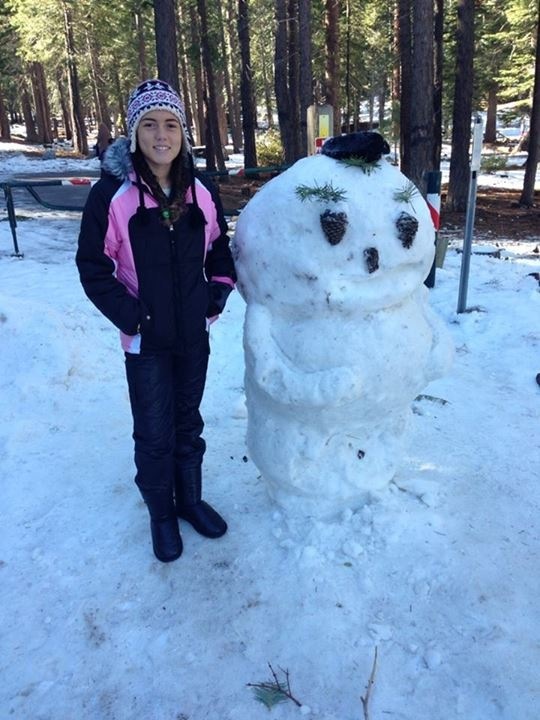 Tahoe is a great place to visit year round!! 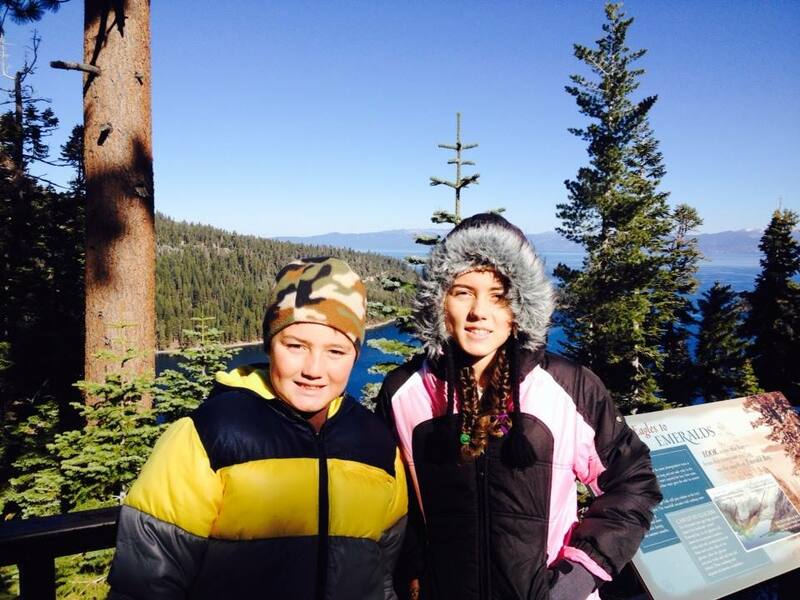 Climate: South Lake Tahoe has a beautiful, snowy highland climate with winters that are quite cold, especially at night, and summers that feature warm to hot days and cool to cold nights with very low humidity. Summertime is the dry season with July averaging only 0.31 inches of rain. In December’s the average is 3.81 inches. 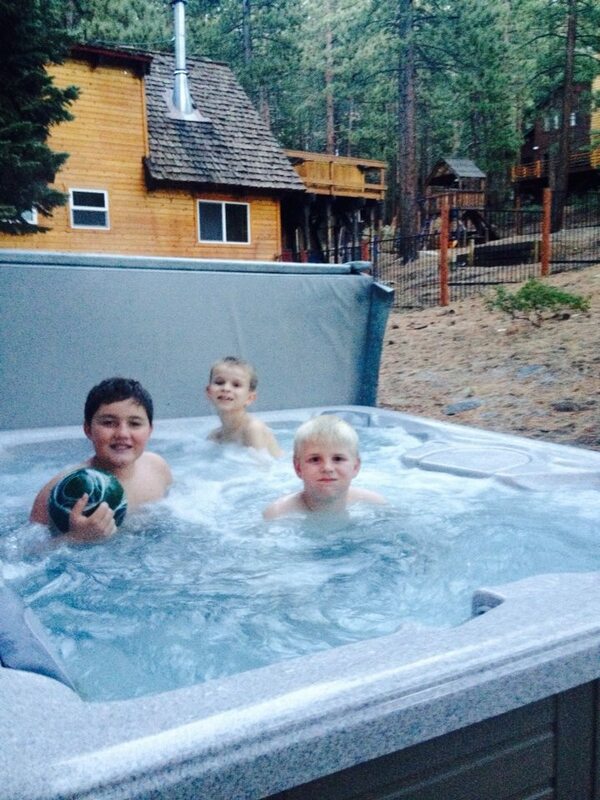 Tahoe averages two days per year that reach 90 °F or higher, most commonly occurring in July and August. Every month of the year Tahoe has at least two days with a low temperatures of 32 °F or lower.The climate is either classified as a Warm Summer Mediterranean climate or a Continental Mediterranean climate. The all-time record high is 99 °F which was set on July 22, 1988, and the all-time record low is −29 °F set on December 9, 1972, and on February 7, 1989. 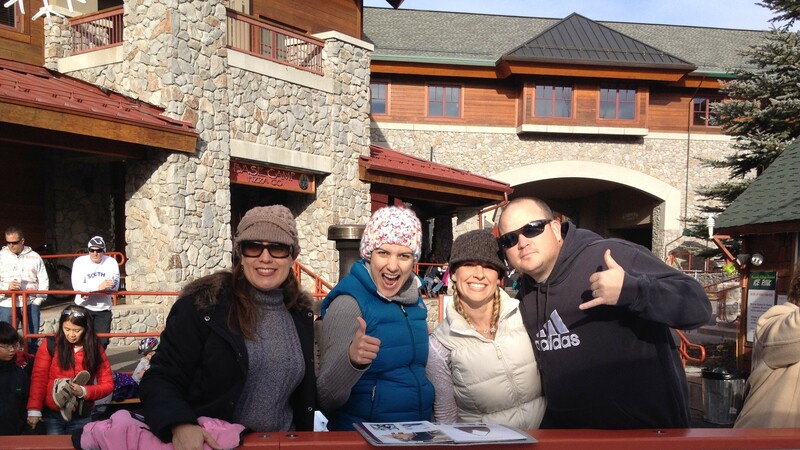 Heavenly Mountain Resort is a ski resort located on the California-Nevada border in South Lake Tahoe. It has 97 runs and 30 lifts that are spread between California and Nevada and four base facilities. The resort has 4,800 acres within its permit area, with approximately 33% currently developed for skiing, boasting the highest elevation of the Lake Tahoe area resorts with a peak elevation of 10,067 ft and a peak lift-service elevation of 10,040 ft.
Heavenly has an average of 360 inches of snow annually, and one of America’s largest snow making systems. 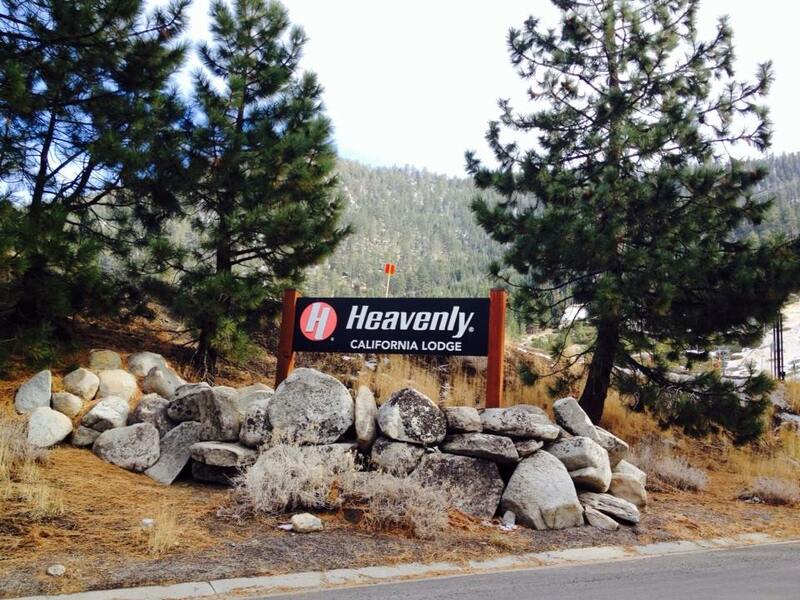 Heavenly’s ski season usually runs from mid November to mid April. 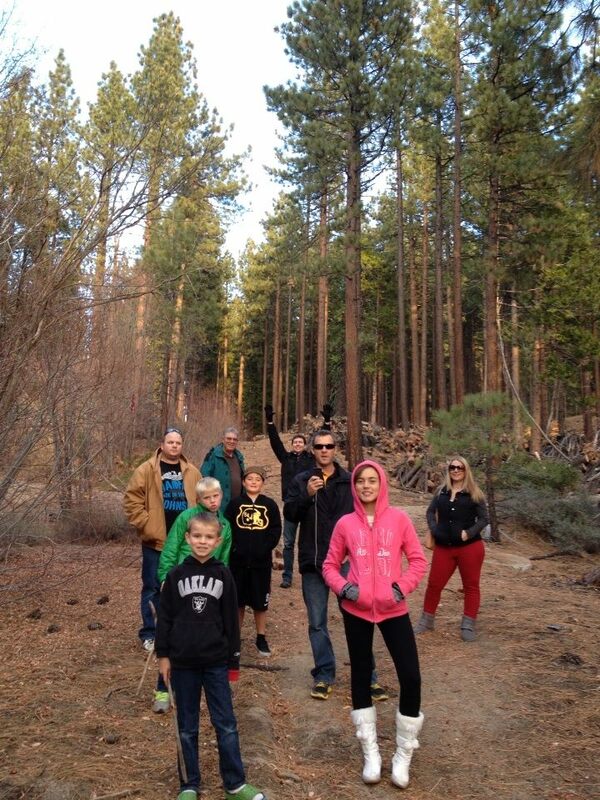 There are many hiking trails near Sugarpine Lodge. We decided to hike just up the road on Powerline Trail which lead to a giant rock formation where we could take pictures at sunset. Powerline Trail is rated “easy” for the level of difficulty. It’s an easy hike with wonderful views. You can go as far as you like and then turn around and come back. Keep in mind that Powerline Trail is shared with bikes. It was a great, free activity for all ages!! The kids had fun picking up sticks and rocks along the way, while the adults were admiring the beautiful luxury cabins along the cliff. We did happen to spot bear tracks on our hike, so be aware of bears. Fortunately, we did not actually see any bears during our stay in Tahoe. Next stop, Emerald Bay!!! 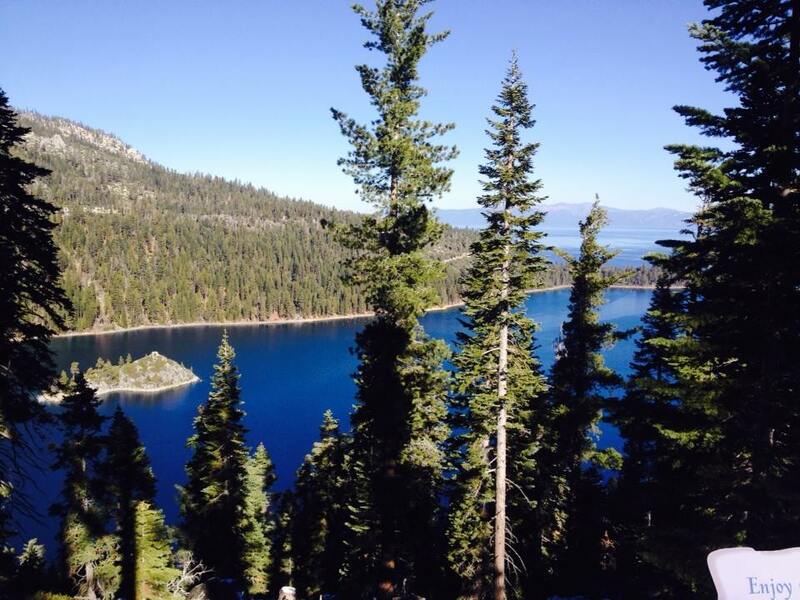 In 1969, Emerald Bay was designated a National Natural Landmark for its brilliant panorama of mountain-building processes and glacier carved granite. The natural beauty, geology and history of this unique island make it one of the highlights of any visit to the Lake Tahoe area. 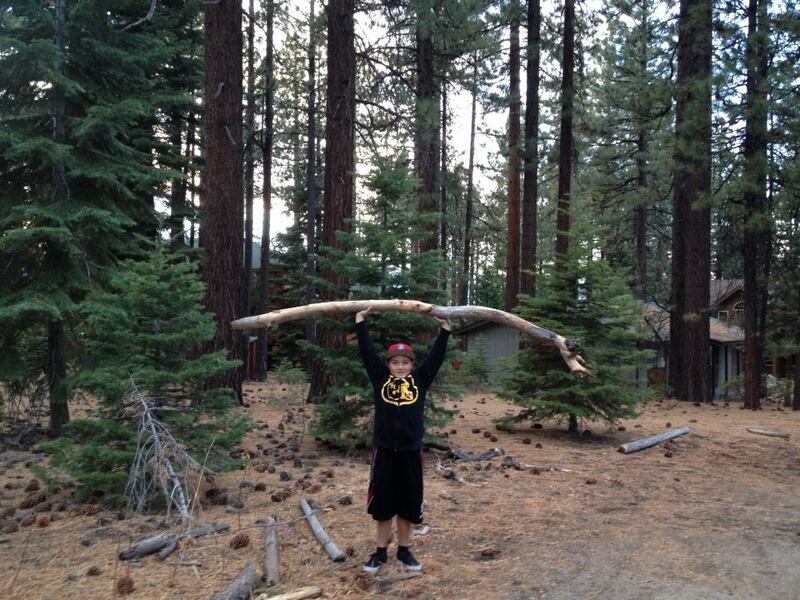 Emerald Bay State Park includes 2 campgrounds: Boat-In Camp and Eagle Point Campground (closed until 2015). The scenic Rubicon foot trail wraps around Emerald Bay, with trailheads at Eagle Point campground, Vikingsholm, and DL Bliss State Park. 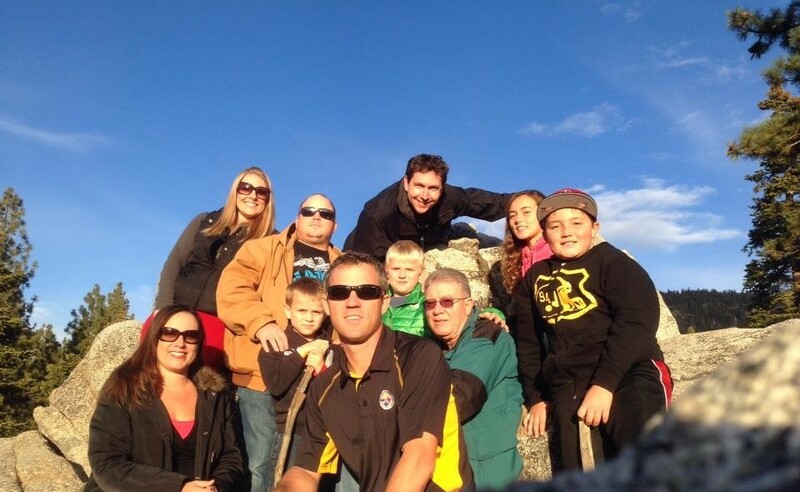 Emerald Bay lookout offers great photo ops and there is railing throughout which is great for kids. Parking is free but a little challenging as it is a very popular lookout spot. We ended up parking on the side of the street. The restrooms are quite nauseating I must warn you. Bring your own toilet paper!!! Since it didn’t snow while we were in Tahoe, we brought sleds (thank you grandma & grandpa) to Emerald Bay and found some great hills. Warning, there are trees at the bottom of the hills. Bring snow/ski clothes, hats and gloves for the kids to avoid a huge raspberry from hard ice which our son encountered. It is a great way to have fun in the snow and it’s free!! The kids were quite happy that we were able to locate snow. 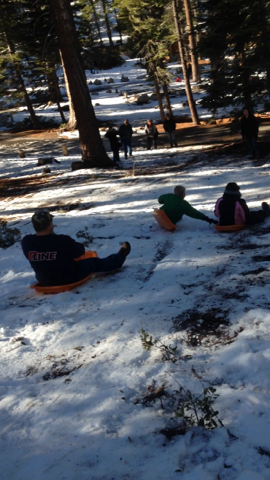 They each took turns flying down the hills on sleds. 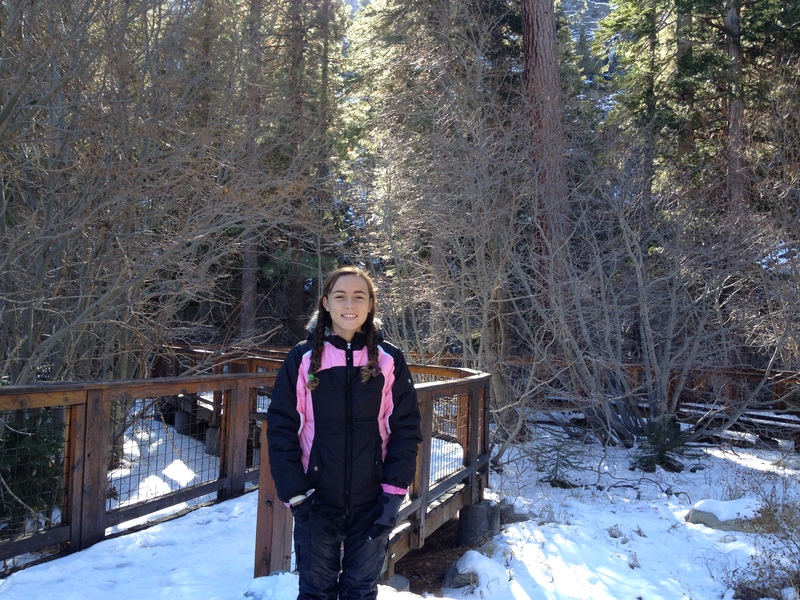 Off to Eagle Falls Trail, Lake Tahoe!!! Eagle Falls Trail Lake Tahoe is located off Highway 89 and is surrounded by some of the most beautiful landscapes in California. Eagle Falls is a popular hike due to its beautiful cascading waterfalls, lush green scenery, trees and it is short. Eagle Falls is a great option for those who may not want to spend hours on a long or strenuous hike, but still want to see Tahoe’s magnificent terrain. The trail is approximately two miles round trip and can be completed in about 30 minutes depending on the hiker. Dogs are permitted on the trail so visitors can bring their dog on their outdoor hike. We even passed one couple who had fishing poles in their backpacks. Not sure exactly where they were going to fish, but there must be fishing. Alongside one of the most blue pristine lakes in California, hikers on Eagle Falls will see the delightful sights of cascading waterfalls, lush green mountain scenery and tall pine trees. 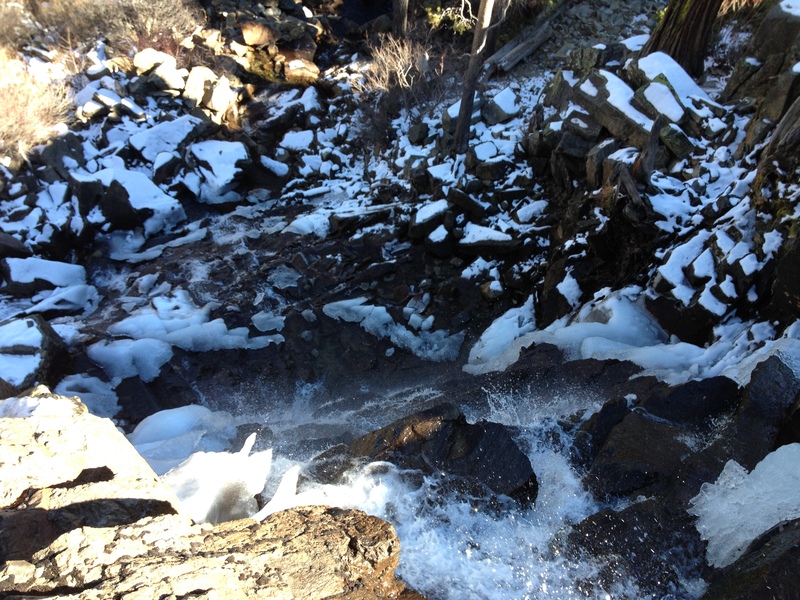 Eagle Falls Trail is open year round and offers hikers an unforgettable outdoor experience filled with breathtaking views. Looking down the falls was a little bit scary as there isn’t a railing or a path. You hike right down to the ledge of the falls. I would not recommend this overlook for kids and be sure to have on good boots that won’t slip. It was icy when we walked down, making it even more unsafe. If you decide to walk to the falls, be sure to take pics!!! 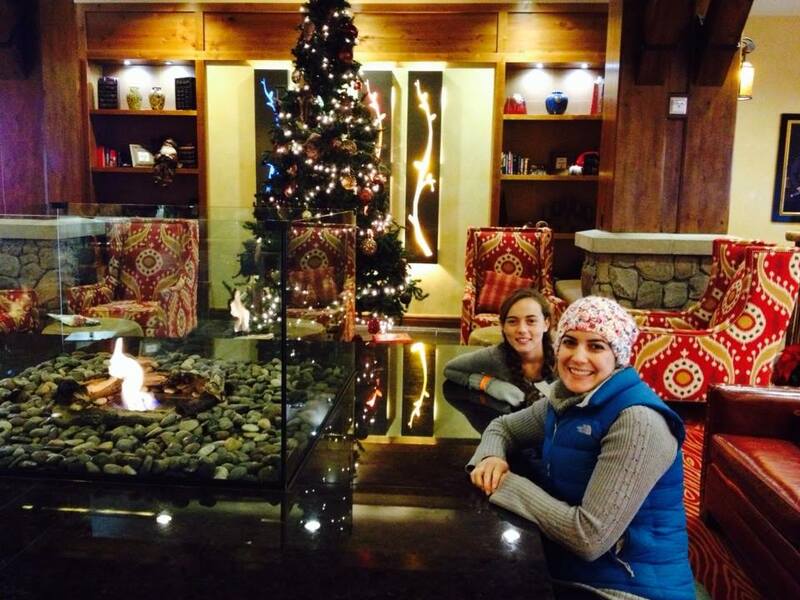 Now for the place that will take all of your money and the kids will never want to leave…..Heavenly Village!!!! Heavenly Village is a great place to spend some time at, although very expensive. The Village includes shopping, ice skating, 8-plex movie theater, mini golf in the summer, a gondola ride, and a bungee trampoline all surrounded by the Marriott’s Timber Lodge. The Village is picturesque including an ice fountain and holiday music throughout. 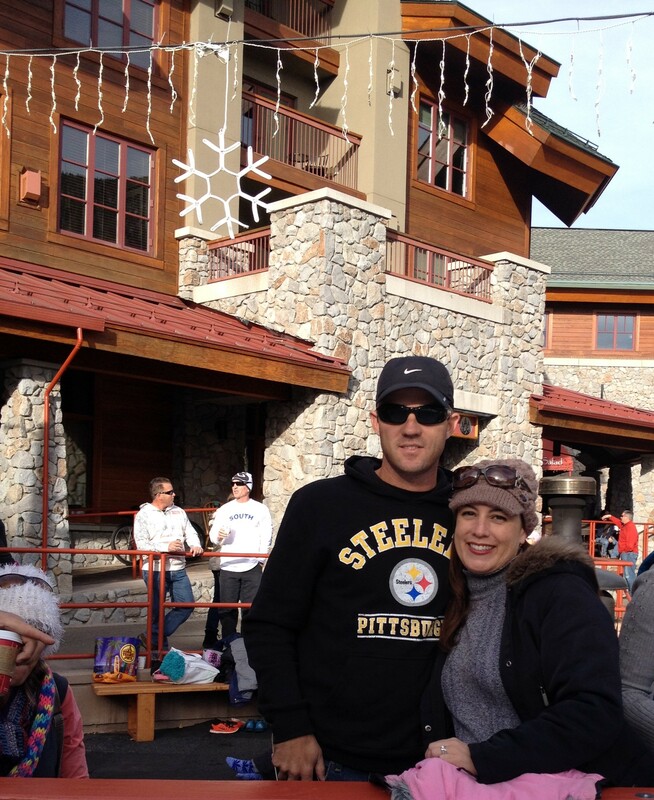 Stop off at the Starbucks and grab a hot chocolate or apple cider while shopping around. The boys rode the gondola and loved it! Warning, the parking is in 15 minute increments and it adds up quickly! You cannot park in the grocery store parking lot across from the Village unless you are willing to be towed. There are signs posted everywhere about parking for customers only. They will mark your tires if you park in the grocery store parking lot to gauge what time you parked there. During the holidays Heavenly Village has events called Heavenly Holidays. Be sure to check out their website for a calendar of events. Heavenly Village has it all! You can go wine tasting, take old-fashioned pictures, attend ski school or stop off for a day at the spa. 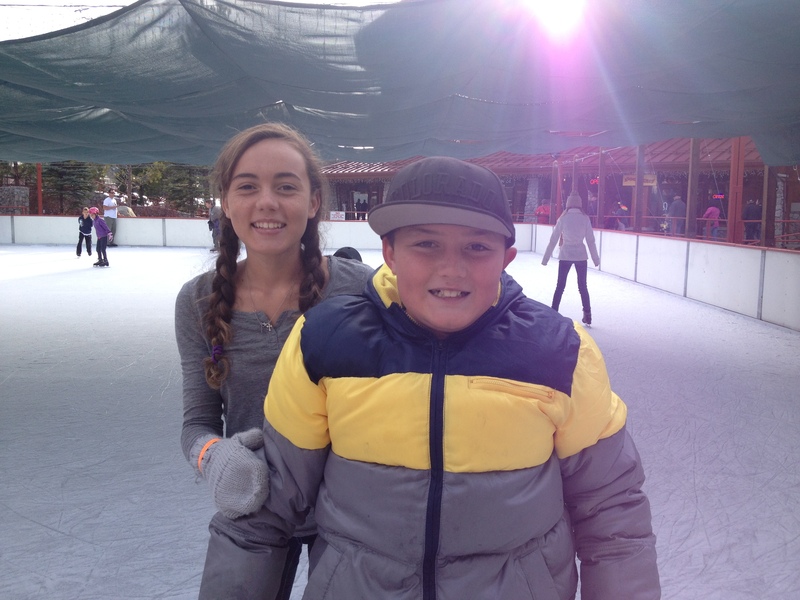 Ice skating is $15 for kids ages 12 and under and $20 for over age 12. 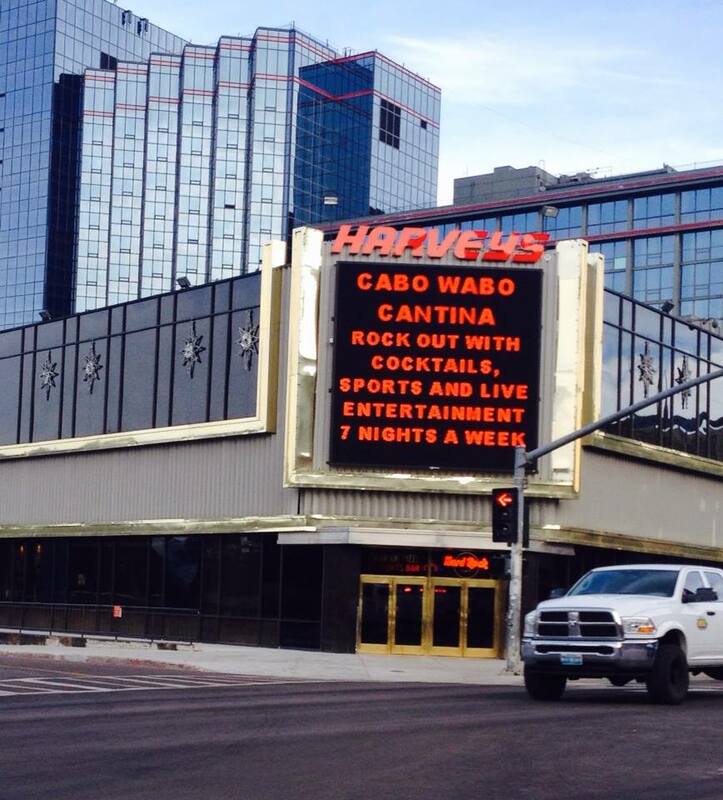 Once you purchase a wristband, you can come and go all day until 8 p.m. The bungee trampoline is $12 for a 6 minute session. 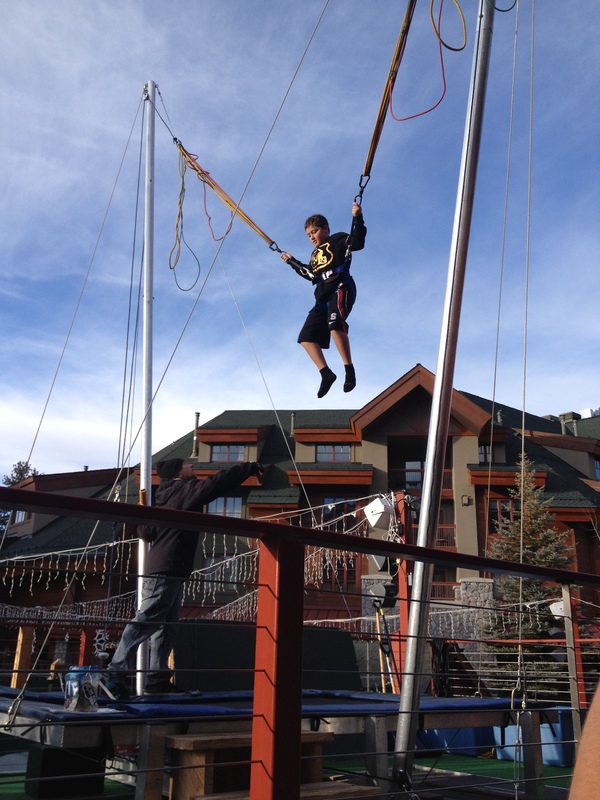 Thebungee has an attendant working at each jump to assist with jumping, flips, and adjusting the harness. Our son was not a fan of the harness but the other kids enjoyed it. 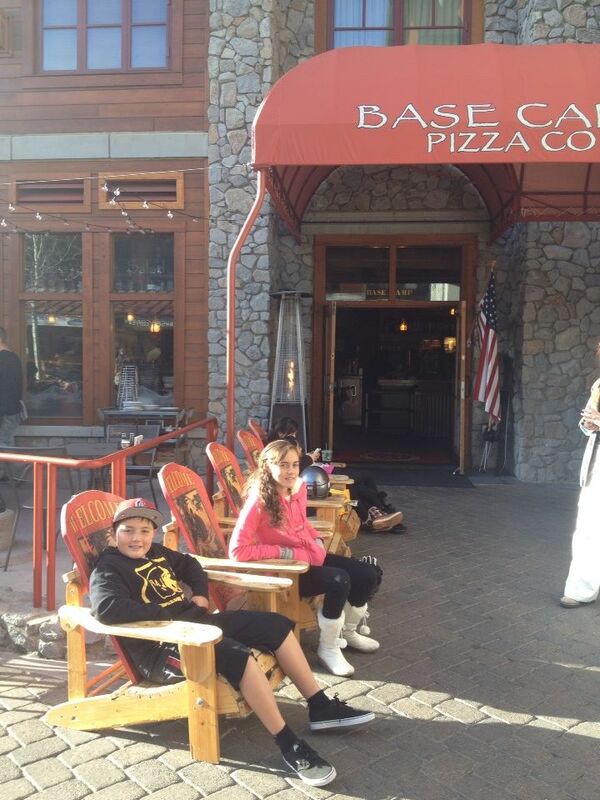 Check out Base Camp Pizza for casual, family-style dining, serving gourmet pizza, salads, and pasts. Choose from the traditional or unique combinations created by the Chef with incredibly fresh ingredients. If you are looking for a timeshare, the Marriott’s Timber Lodge is located in the heart of the South Shore within Heavenly Village. 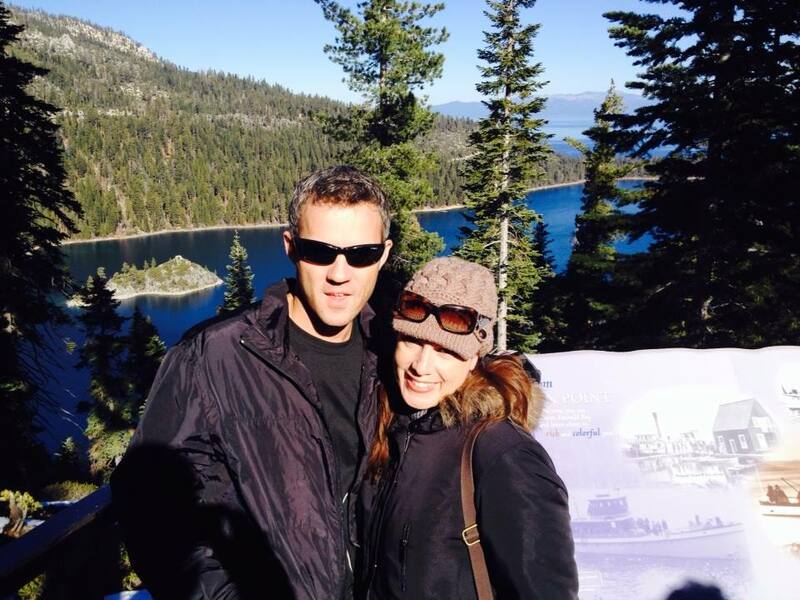 It is situated at the base of the world-renowned Heavenly gondola and considered one of the top resorts in South Lake Tahoe. This luxury resort offers spacious one, two, or three-bedroom villas with fully equipped kitchens, TVs with DVD players, washer/dryers and private balconies. The guest rooms include mini-refrigerators, microwaves, king-size beds and sleeper sofas.